SUVs are hot, replacing cars as the popular choice for Canadian consumers. The subcompact segment is leading that parade. It has grown from fewer than 25,000 units in 2013 to 70,000 last year and is forecast to surpass 100,000 units by 2020. Into this fray, Hyundai launches the Kona — the fourth and smallest member of the company’s SUV line-up. It figures the Kona will attract singles and young couples, whereas the Tucson appeals to singles and young families, the three-row Santa Fe XL to active families and the Santa Fe Sport to mature adults and post families. 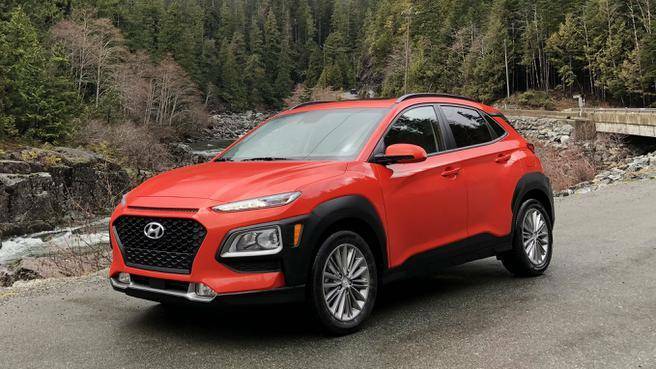 Aside from the marketing talk, Hyundai points out this striking newcomer is a hint of what the others will look like as they come in for a redesign. Despite its diminutive size, the Kona comes across as a larger vehicle with pronounced fender flares emphasizing large — up to 18-inch — rolling stock, deeply sculpted sides and artful use of LED lighting. The new cascading grill will be seen on all vehicles from Hyundai going forward. The interior is equally stylish, without being overdone. There is a strong character line running from door to door and round elements throughout, with nicely-sized and shaped buttons for major controls. Like many others, the AVN (audio, video, navigation) screen appears to float above the instrument panel — a larger version for upper tier trim levels with navigation.